Today’s review is on the Sulwhasoo First Care Activating Serum, which i purchased from the Sulwhasoo counter in Tangs Orchard. I got it quite a few months ago, when the 60ml retailed for $106. I’ve also briefly mentioned this before in an earlier post on the serums and essence that I’ve been using. – Membranous Milk-vetch promotes natural skin circulation and Dwarf Lilyturf and Licorice boost synergy among herbal extracts to restore skin’s natural healthy radiance. – Absorbing instantly and deep within the skin, this serum leaves the skin soft, smooth and supple, prepares skin to receive treatment and boosts the efficacy of skin care used throughout the regimen. I’m going to come right off to say 1) i love this product 2) i think the effects are amazing and 3) i don’t have the pictures to prove how amazing it is. 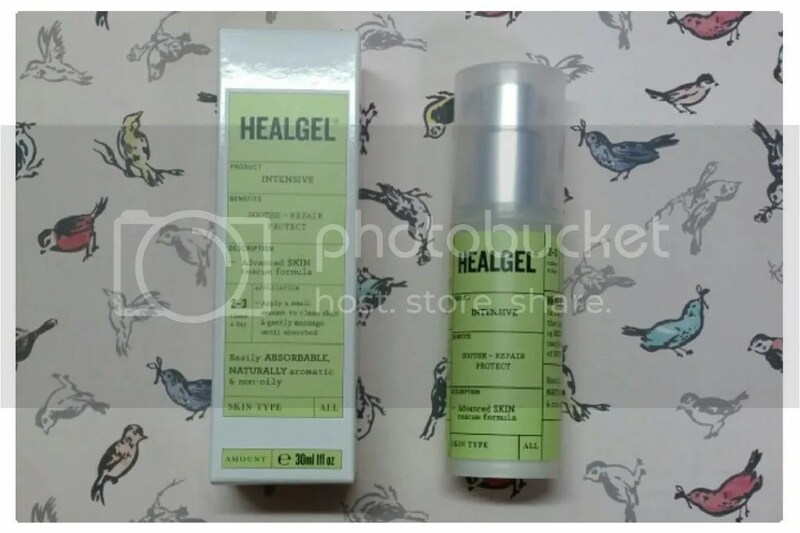 I got this Healgel Intensive from the feelunique website a long time ago – they had a 20% discount code going on so I went and grabbed this without having done any research on it, and I’m damn glad I did. HealGel Intensive is a multi active formula that helps to speed recovery and resolve a wide range of skin problems. It is easily absorbed, naturally aromatic, non-oily and suitable for all skin types. This cooling gel provides a protective barrier allowing the intensely active ingredients to work beneath the surface of your skin. Arnica and Madecassoside are suspended with powerful peptides and biodynes to initiate a uniquely soothing and collagen boosting process. This product comes in a light and nice little pump bottle. It’s not clear, but it is transparent so I can see exactly how much is left as I use it. I know it’s not a big deal but I love it when I can see how much is left and I love pump bottles – it’s convenient and hygienic. The pump is also very well made; I can control how much I want easily unlike some pumps that just squirts out uncontrollably. As a skincare junkie, trying out new skincare is one of my favourite activities of the day. And it’s particularly enjoyable when it comes in cute packaging such as this Skin Inc Regenerate Vitamin A Serum! But of course, just looking good in the bottle does not mean anything to me – does the serum itself perform as well as it looks? I’m a skincare addict so at any one time, I have several different skincare products in each category in rotation. A quick peek today on some of the serums and essence that I’m now using. To me, essence and serums are pretty much the same thing – both have concentrated amounts of active ingredients that targets specific purposes. I use them after cleansing and toning, and before all other creams and oils. 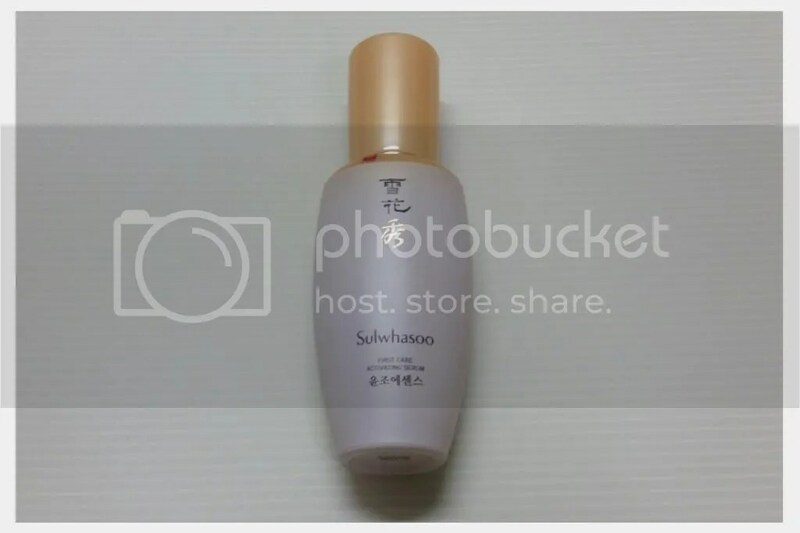 My daytime serum has been the Sulwhasoo First Care Activating Serum; this is very lightweight, with an amazing ginseng scent. I use this during the day because it’s not sticky at all and does not cause my makeup to shift around despite the tropical Singapore weather and humidity. The Clarins Shaping Facial Lift is something that I apply to my neck when I remember to – this is more for prevention; I don’t have saggy skin yet so I don’t know if it works. This has a rather thick cream-like texture but absorbs quickly without leaving a sticky film. My mum loves using this too. I picked up the O.S.T Original Pure Vitamin C20 Serum after reading a lot of great reviews, particularly on healing scars and skin brightening. I use this at night; the texture is really thick and sticky, so I usually mix a drop or two with other more fluid serums. It takes a while to sink in, but I feel that my skin does appear to be brighter and clearer since I started using this. 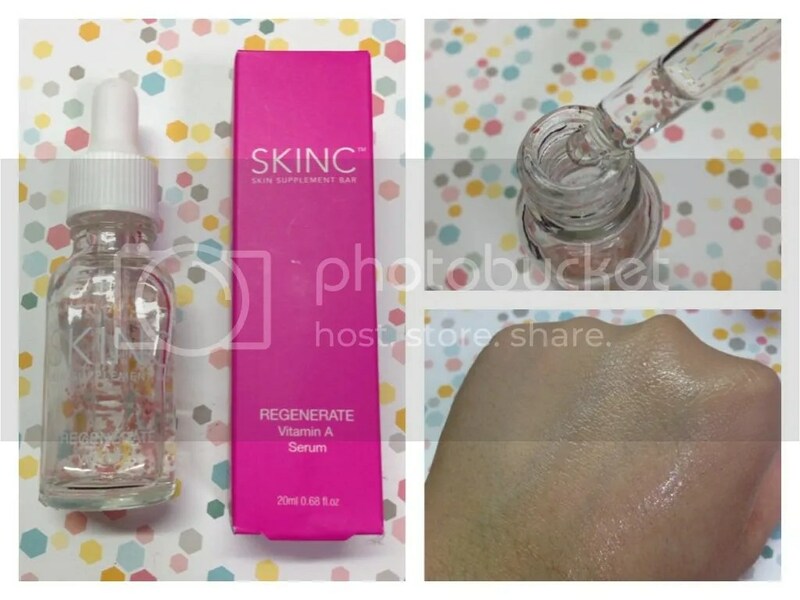 A new addition to my night time routine is the Skinc Skin Regenerate Vitamin A Serum which I recently received in a beauty box; meant to help with uneven skin tone and dark eye circles, this has little beads that pop on application. The texture is light and watery, and absorbs really quickly, but I havent been using this long enough to see results. Lancome Visionaire Advanced Skin Corrector is something that I have been trying to finish up; this is really expensive but I’m unable to use it on a daily basis as it causes me breakouts if used consistently. I don’t see any improvements in my skin and I won’t be repurchasing. 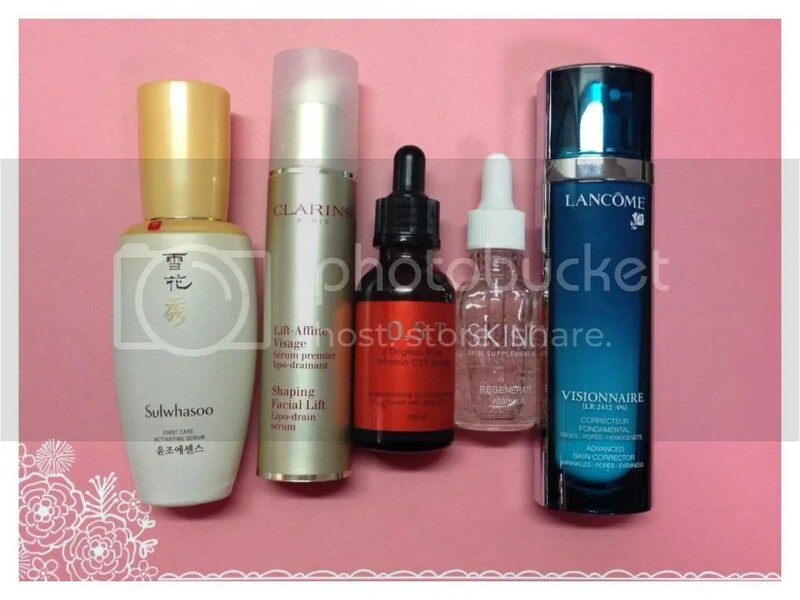 Other than these, I also rotate in other sample size serums from beauty boxes regularly. I like to rotate products not just because I love trying new products, but I also think the skin can get used to a certain product when used over prolonged periods. There are also days where I feel my skin requires specific care – like moisture, blemish-control, soothing, etc; these requires specific products to meet the needs. What are the serums that you’re loving right now? Do you rotate between different serums too? 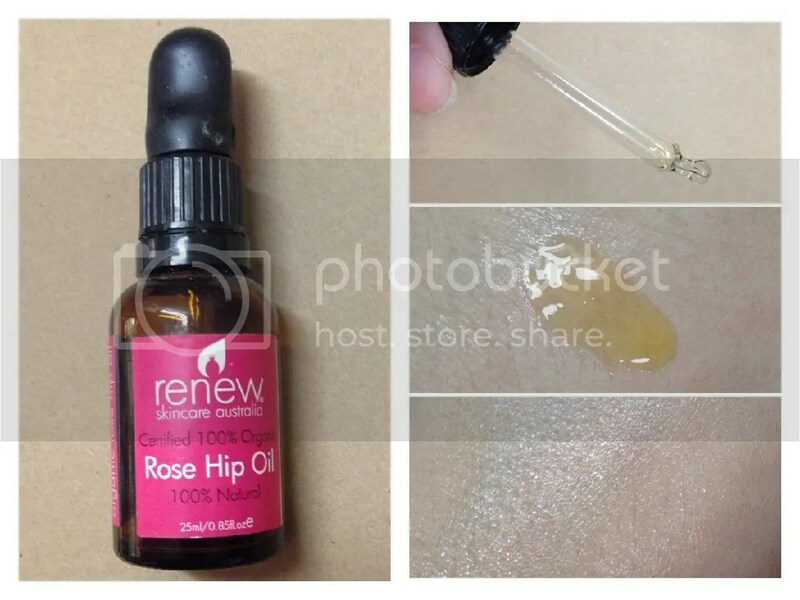 I first wrote about the Renew 100% Organic Rose Hip Oil here – I had only used it for a couple of months then, and it was my first attempts at using facial oils, so I didn’t really know what to think of them. Now, after using this for a few months, I’m back with a full review! In fact, I’ve actually nearly used up the entire bottle – I have only about 1-2 more uses left as I write this! In terms of packaging, it’s in a nice dark glass bottle with a pipette – I liked the packaging initially, as it’s easy to control how much product is dispensed. However, the rubber at the top of the pipette started to melt in the last couple of months, making it sticky and quite gross. The oil itself has a rather heavy texture – it is an oil after all, and it feels like one. It’s not very fluid, with a thickness to it, and I have to rub it between my palms so that the heat makes it easier to spread. It takes a few minutes for the oil to fully sink in, quite a lot slower than cream; even after having it on for awhile, there’s still some shine on my face. I don’t use this in the daytime because being in a hot country, this will definitely roll off my face. I honestly love this oil. Although it’s rather heavy, my very dry skin drinks this up and when I wake up the next morning, my face feels plump and comfortable, even if I had spent the night in an air-conditioned room. I thought it would smell like roses, but it doesnt – it’s quite a strange scent, so if you’re sensitive to scents, I would suggest giving it a whiff first. I’ve read that it helps with healing scars, but I don’t find it true for me – my old pimple scars took just as long to heal while using this. But I have to say that it really helps relieving the dryness in my skin, making it look a lot more supple and soft, and a lot younger! When I have dry patches, this really worked like a miracle – it’s all gone in just a day or two! If you suffer from very dry skin and can stand the oiliness and the weird smell, I would say, do give this a go. I found mine for less than S$25 for a full 25ml bottle, which is really great value for what it did for my skin. 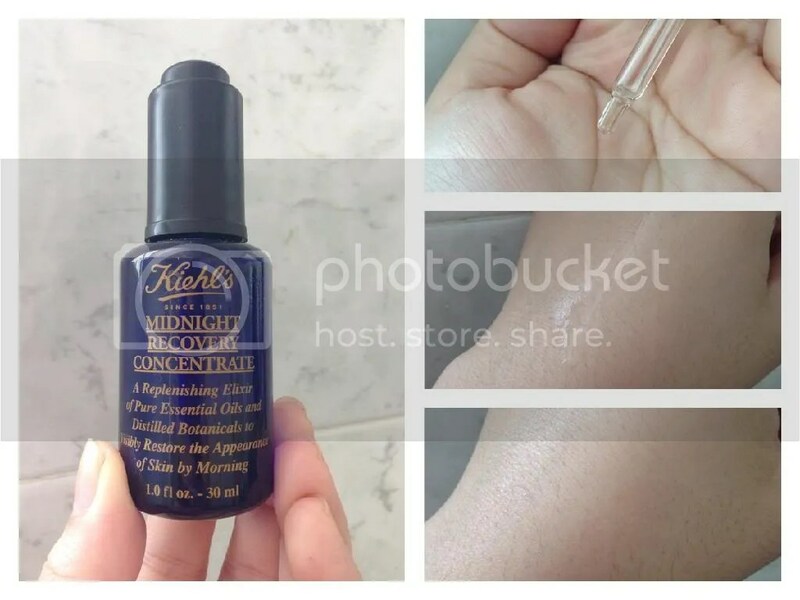 Ever since I received a little sample of the Kiehl’s Midnight Recovery Concentrate, I’ve been in love with it and have been wanting to purchase a full size. Recently, I managed to convince my bf into getting a full bottle for himself (I said it’s good for him, but honestly I wanted to use it myself). Purely Potent Over-Night Repair; Regenerates, repairs, and replenishes skin for a smoother, healthier skin. Works with the skin’s natural nocturnal activity when skin is most receptive to repairing itself from daily aggressors to dramatically restore skin. 99.8% naturally-derived and paraben-free. The product is made of essential oils, such as Evening Primrose Oil and Lavender, and botanical lipids like Squalene. The oil is packaged in a dark glass bottle with a little pipette to dispense the product. It’s not the most travel friendly item as it seems quite fragile but I love how it looks. The pipette is also great to dispense the ideal amount of product. In terms of texture, it is an oil after all but it’s very lightweight and feels more fluid than an oil. It’s also clear in color and dries down really quickly without leaving an oily residue which is amazing. A quick note on my skin type – I have very dry skin and I don’t often find products too greasy for me, but this really wins hands down in how fast it absorbed. My bf has very oily skin, and he didn’t feel that this is too oily and loved it! I usually use this before bed, and because technically I don’t own it, I only use this half a week when I’m over at the bfs. Whenever I use this, I wake up the next morning to really lovely, plump and well moisturized skin. My skin glowed, an amazing feat for dry skin, but not in a “I have too much oil” way. It’s meant to be an overnight repair product, so I don’t use it in the day. It has a lovely lavender scent that’s not too overpowering. Kiehl’s recommend to use 2-3 drops each time and to pat it in before massaging it all over. That’s what I do, and between my bf and I, after using it for a month, it’s still nearly full so it think it’s totally worth the S$80 it cost for the 30ml bottle! Obviously, I love this oil and would highly recommend this to anyone looking for a good face oil. 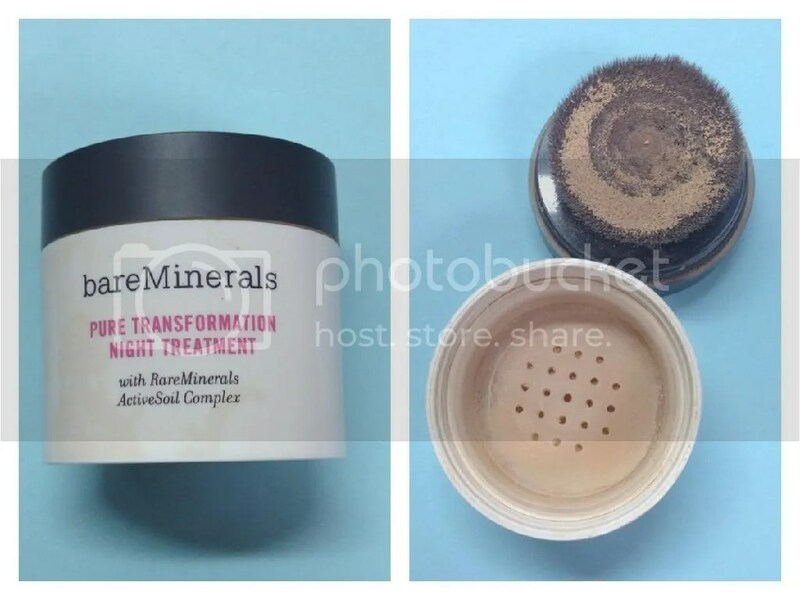 I’ve been rotating in the bareMinerals Pure Transformation Night Treatment into my regular routine about 2-3 times a week, after getting this some time ago. Yes, the lure of being able to transform while I sleep sucked me in. First, I thought the packaging was very wasteful. The box that it came in was huge but the bottle is about half the box size. Then, the bottle itself has even less product than it looked! There was a huge brush taking up half the space of the bottle! This was really expensive at US$60 for 4.2g of product. I did like the brush – it helped to buff the powder easily into the skin, but with a deep well and a sifter in the bottle, it’s quite hard to get product out. I had to close the bottle, shake it about, and then use whatever is on the brush. Or I can tap the powder out on a separate plate. After cleansing and toning, I buff the product all over my face – usually with 2 layers. It felt strange at first going to bed with makeup on, but it never transferred onto my pillows, so I got used to it. The texture is very lightweight and the powder is very finely milled, and felt really comfortable on like I didn’t actually put anything on. The good part is, I really do get to wake up looking pretty, but so would anyone who puts makeup on before bed! After using this consistently for about 2 months, I did not see my pores reducing in size and my skin was not more luminous, as claimed. My dry skin also felt even drier; whenever I use this, I would wake up feeling like I needed a good moisturizer. My verdict? No. I felt that this was way too expensive for what it is – makeup to sleep in. My skin texture did not improve visibly, it’s very gimmicky and I am not a fan of the terrible packaging.